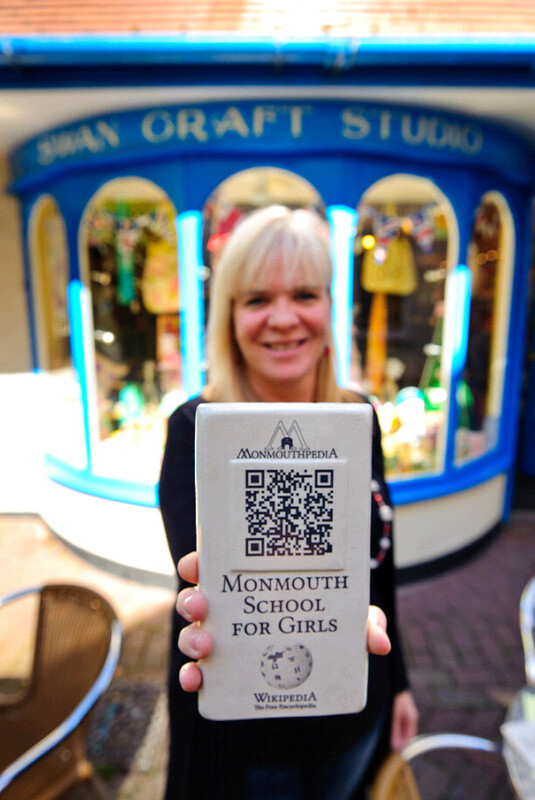 Volunteers and students at Swancraft Studios, Monmouth did their bit for Monmouthpedia this week when they handed the ceramic plaques with QRpedia codes to locals for display around the town. Swancraft Studios, Monmouth’s own art and ceramics studio, is a council funded enterprise where people of all levels of ability are inspired and supported in the creative arts. The team at Swancraft Studios were called upon to help with the world’s first Wikipedia project to cover a whole town by local man John Cummings. John, who came up with the idea of Monmouthpedia, didn’t forget the studios where volunteered before university and asked them to get involved in making plaques for the town. Monmouthpedia uses use QRpedia codes around the town, a type of bar code a smartphone can read through its camera that takes people to a Wikipedia article. QR codes are extremely useful, as physical signs have no way of displaying the same amount of information and in a potentially huge number of languages. Previous Monmouthpedia – so what’s in it for local businesses? Next I’ve seen recycling teams mixing red and purple recycling bags together: why are we asked to separate them?